Facebook takes the hard work out of goofing off. ‘If time be of all things the most precious,” Benjamin Franklin said, “wasting time must be the greatest prodigality.” But he had never heard of a status update. Facebook is the world’s foremost purveyor of information you shouldn’t care about. Facebook founder Mark Zuckerberg is to uselessness what Henry Ford was to the automobile. He has mastered it on an industrial scale and is riding it to a vast fortune. At more than $100 billion, the valuation of Facebook equals the annual GDP of Morocco or Vietnam, countries that don’t top anyone’s list of economic powerhouses, but do actually produce some things of value. Facebook has transformed oversharing from an annoying habit of the poorly socialized into the very stuff of daily interactions. No thought is too banal, no event too minor, no mood too passing, no photo too embarrassing to be posted on Facebook. One of the great self-regarding egotists of all time, the late author Norman Mailer, might have blanched at the unrelenting self-exposure of it. #ad#Facebook has been a boon to employers vetting prospective employees and to divorce lawyers looking for incriminating evidence. Once, taking vodka shots out of the bellybutton of your friend at the bar at 2 a.m. might have been an ill-considered caper to laugh about the next day. Now the photo may well end up on your “timeline.” In the world of Facebook, everyone is his or her own personal TMZ. None of this is to slight Zuckerberg, who saw the potential of an online network enabling mostly meaningless interactions and conceived, marketed, and grew it with the genius touch of a truly inspired entrepreneur. He is as audacious as he is brilliant in the tradition of the great American businessman. Anyone who saw the movie The Social Network surely prefers that this outsider with a hoodie rules our digital world rather than the overdog Winklevoss twins, his Harvard rivals, who went on to row in the Olympics and claim he stole their idea. It’s not that Facebook has no redeeming value. It brings together people with similar interests who wouldn’t meet otherwise, and is a powerful organizing tool, in causes ranging from high-school reunions to Middle Eastern revolutions. And, oh yeah, it reminds you of friends’ birthdays. This is all to the good. Yet Facebook is overwhelmingly the ephemeral chasing the trivial. The “like” and “poke” functions have an appropriately grade-school feel. (It’s hard to believe that Facebook once grew its business on the basis of its supposed cool.) The designation “friend” is often a poor simulacrum of the real thing. In a notable Atlantic magazine cover story, Nicholas Carr asked, “Is Google making us stupid?” but compared with Facebook, Google is the King James Bible. Google is the entry point to a world of news and information beyond what leftovers your old college roommate is eating for dinner tonight before taking her papillon, Princess, for a walk. The T. S. Eliot line “distracted from distraction by distraction” could have described the temptations of 21st-century social media. Other technologies — the telephone, television, e-mail — have had the same double-edged capacity to enable work and bring people together, or fritter away time on nonsense. Facebook tilts toward pure distraction, which is one reason a pall of doubt hangs over its post-IPO future. About half of the people in one poll say Facebook is a fad. Mark Zuckerberg is mentioned in the same breath as Steve Jobs and Bill Gates, but his product is considerably more vaporous. The threat to Facebook will always be the advent of some new and even more alluring way to waste time. 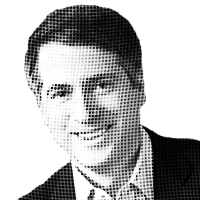 — Rich Lowry is the editor of National Review. He can be reached via e-mail: comments.lowry(at sign)nationalreview.com. © 2012 by King Features Syndicate.